The well-restored and now partly pedestrianised historic centre of Bormio, with its ancient palaces, towers, churches, chapels, cobbled streets, squares and fountains, is a living reminder of the town’s glorious past as a rich trading pos between Venice the Duchy of Milan an the areas north of the Alps. 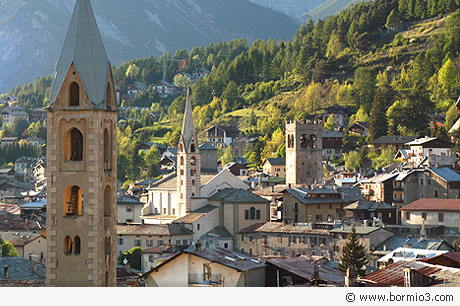 Most of the buildings date back to the 15th ad 16th centuries, the height of Bormio’s splendour, when imposing churches appeared, the new palaces were painted and decorated with elaborate stone portals, and high towers were erected by the noble and merchant families as an outward display of their power. Today’s visitors can indeed steep themselves in history as they wander through the old, winding streets. A good starting point is Via Roma. This fine street lined with ancient palaces begins with the beautiful Romanesque Church of San Vitale, with 14th century wooden altarpiece inside. Further on is the Torre degli Alberti, the town’s most imposing tower building, where Ludovico il Moro and his wife Beatrice d’Este in 1946. Via Roma leads to Piazza Cavour, better known a Piazza del Kuerc, which has always been the hub of civic life in Bormio. This square is dominated by the imposing Collegiate Church of SS Gervasio e Protasio, founded in the 9th century, but completely rebuilt after it was burned down in 1621, when Spanish soldiers ravaged the town. Inside are some fine works of art, 16th and 17th century wood sculptures, an a 17th-century organ and choir stalls. In the centre of the square stands the Kuerc, the medieval porticoed building where justice was once administered and public meetings held, and now a focus for cultural events and performances behind which rise the high Torre delle Ore, or clock-tower.This airy, sunny square is filled with shops, bars and restaurants; tourists mingle with the locals here in summer as they enjoy an aperitif or eat outside. To the right of the Collegiate church, Via Morcelli leads to the Old South-East Customs House, which once controlled the road from the Gavia Pass. The ancient Combo Bridge over the Frodolfo river (a tributary of the Adda form the Valfurva) leads into the old Combo district. The two main historical sites here are the Church of the Crucifix (restored in the 19th century, with fine 16th-17th C. Frescoes) and the Sassello Church (15th-century frescoes). In the upper part of the town, reached from Piazza Cavour by Via della Vittoria, stands the 17th – century Palazzo De Simoni, dominated by a medieval tower. 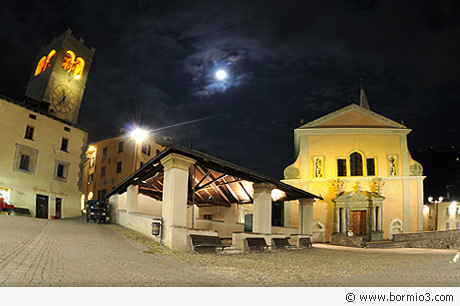 This building, now the Town Hall and Library, also houses one of the most interesting museum in the Valtellina, which boasts a collection of some 3000 local historical exhibits. The 14-room Civic Museum, spread over two floors, is divided into two sections, art and history, and ethnography. The collections include artworks from palaces and churches in the area (including a fragment of an 11th-C. Fresco depicting St. Cecilia, a large 17th-century altarpiece in gilt wood by Bartolomeo Paruta, and a 19th century canvas attributed to Franceso Hayez), sculptures, carved and painted furniture, ex voto, World War I memorabilia from the Ortles Cevedale front, and a collection of historical carriages and sleighs. The museum also has reconstructions of period interiors illustrating daily life at different times in history.